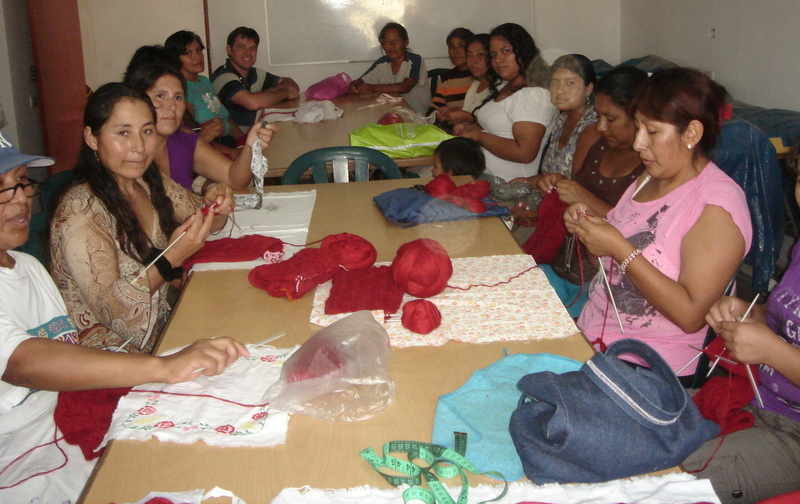 In 2010, as demand for Mamacha's hand knitted products was seeing successful growth, we began working with a new group of women to the north of Lima. Amy had previously visited a women's centre where she met women keen to work and knit, but who had no market or means of attracting any orders. We gave them some detailed designs and plenty of guidance on quality control, and the first order was a great success. Since then we have ordered more and more products from them, and they too are growing in number. They are hard working and motivated and keep a high level of quality control. They live about an hour's drive north of the very outskirts of Lima, in the desert that covers the whole of Peru's coast. Our local co-ordinator buys the alpaca wool from Michell in Lima and distributes it to the women, who meet regularly in a local hall to knit our orders, as seen in the picture below. They attach Mamacha labels to their finished products, and write their name on them so you'll know who has knitted your garment. They are thrilled to have had a steady stream of work since 2010 and we look forward to a long relationship with them. The photo below shows the ladies meeting with James.